‘아트선재 프로젝트 스페이스’에서는 2017년도 여섯 번째 프로젝트로 서울시립미술관에서 진행 중인 ‹신진미술인 지원 프로그램›의 올해 선정작가 최윤의 두 번째 개인전 «하나코, 윤윤최, 최윤 개인전»을 개최한다. 최윤은 (공공) 환경미화, 실내장식, 취미사진, 전통문화, 한류문화 등 소위 통속적이라 칭해지는 것들에 주로 관심을 가져왔다. 이러한 이미지들은 과거나 미래에서 온 것 같지만 동시대의 부산물이며, 우리의 일상에서 쉽게 발견할 수 있지만 주목하지 않으면 보이지 않는 것들로 어딘지 생경함을 자아낸다. 최윤은 이러한 이미지들을 ‘찌꺼기’라 부르며, 이들을 포착하고 이접, 재배치하면서 본래 이미지가 사용되는 방식과 이것에 투영된 사용자 개인 혹은 집단의 심리와 믿음이 무엇인지 질문해 왔다. 이번 전시 «하나코, 윤윤최, 최윤 개인전» 역시도 이러한 질문의 연장선에서 그가 재생산해낸 이미지들이 무엇을 그리며 어디를 향하고 있는지를 작업에 등장하는 세 인물 ‘하나코’, ‘윤윤최’, ‘최윤’을 통해 살펴보고자 한다. 작가는 이미지 생산자 ‘윤윤최’라는 이름으로 자신의 홈페이지에 작업의 파편들(동영상, 글, 사진 등)을 업데이트해왔다. 이들은 모두 이미지로 치환되어 홈페이지의 하얀 배경 위에 겹겹이 쌓이고 눌어붙어 서로 엉켜있는 것처럼 보인다. 따라서 개별 작업의 경계나 작업과 작업을 위한 재료의 구분을 파악하기가 쉽지는 않다. 이처럼 실상 다른 시제를 가진 개별적인 요소들이 만나 홈페이지 안에 하나의 풍경을 만드는데 이러한 방식은 최윤의 작업에서도 드러난다. 이번 전시에서 ‘윤윤최’는 이미지의 생산 및 작동 방식을 담당하며, 홈페이지에 파일들을 업로드하듯 전시장에 파편들을 던져 놓는다. 이전 작품에 등장하는 구성물들을 추출하여 재가공하고 이들이 서로 언제든 접착 가능하게 놓아둔다. 한편 ‘하나코’는 2015년부터 최윤의 작업에 등장하는 ‘진짜 이름으로 불리지 않는’ 익명의 인물이다. 여러 편의 영상이 하나의 재생 리스트로 엮인 ‹하나코와 김치오빠 외 연속재생(이하 ‘하나코 연속재생’)›(2016 –)에서는 하나코로 추정되는 인물이 시공간을 넘나들며 무모하고 알 수 없는 행동을 지속한다. 예를 들면 직립을 거부하고 기어 다니거나, 뱅글뱅글 돌며 사진을 찍으면서 방위를 흩트리고, 꺼내면 불편한 것들을 들춰내고, 바닥에 몸을 던지고, 벽에게 말을 건다. 작가는 이러한 행위를 “기존의 지도가 지니고 있는 물리적인 딱딱함을 어떻게든 거슬러 보려는 움직임”이라고 설명한다. 이는 지도로 비유되는 고정되고 단단한 관념과 규범이 자신의 무모한 행동으로 깨지지 않을지라도 계속해서 부딪혀 보고자 하는 작가의 의지와 믿음처럼 들린다. ‹하나코 연속재생›은 벽 너머 하얀 전시장에서 수많은 하나코와 도구들로 분할, 변환되어 펼쳐진다. 영상 속의 얼굴 없는 몸인 ‘하나코’는 전시장에서 ‘윤윤최’를 만나 현실의 여러 이미지로 실체화된다. 영상에서 ‘하나코’와 함께 등장했던 오브제들은 ‹퍼포먼스 도구와 찌꺼기›(2017)라는 제목으로 전시장에 나열되고, 기존의 ‹하나코50›(2015)은 100 명으로 늘어나 각각 100 장씩 인쇄되어 벽에 진열된다. 이들은 서로를 지시하며 전시장에서 울려 퍼지는 목소리를 따라 언제든 영상 속 하나코처럼 풍경에 접속할 수 있는 상태로 놓여있다. ‘최윤’은 이에 그치지 않고 전시장 안에 여러 요소들을 추가한다. ‹하나코 연속재생›에 등장하지 않았던 피카츄 인형이나 음식 모형들과 같이 조악한 물건들이 약간 변형된 채 이곳저곳 배치되어 전시의 ‘찌꺼기’ 역할을 한다. 이들 주변에는 마치 데이터의 잔여물인 캐시 파일과 같이 끝까지 지워도 남겨진 찌꺼기의 찌꺼기들이 인터넷 동영상을 흉내 내는 ‹SS 시리즈›(2009 – 2017)에 달라붙어 곁다리 장식으로 등장한다. 마찬가지로 어디선가 본 적 있는 인사하는 마네킹 ‹인사봇›(2017)이 빠른 통신 속도를 홍보하며 전시장 입구에 서 있고, 인테리어로 애용되는 완제품 이미지 ‹창문그림액자›(2017)와 ‹해바라기 바탕화면›(2017)은 전시장 벽면에 붙어있다. 이러한 요소들은 탈착을 반복하며 벽 사이를 오가고, 유리창 너머 변형된 한복을 입은 사람들로 북적이는 거리의 풍경과, 그리고 또 다른 풍경으로 링크된다. 이렇게 전시장에 흩뿌려져 있는 요소들은 마치 ‘하나코’, ‘윤윤최’, ‘최윤’이 서로 섞이지 않는 듯하면서 이어지는 것처럼 풍경들 사이에서 점프에 점프를 거듭하며 연결을 시도한다. 결국 작가는 여러 대리인을 오가며 중계하는 인물로서 ‘윤윤최’이고, ‘하나코’이면서 ‘최윤’인, 다중의 혹은 익명의 목소리를 정제되지 않은 상태로 내질러 버린다. 그는 왜 이런 행동을 하는 걸까? ‘하나코’ 하면 제일 먼저 일본의 흔한 이름 중 하나라고 생각하지만, 얼굴에서 ‘코’ ‘하나’ 만 기억에 남아 붙은 별명이거나, 식민지 시절에 불린 이름이기도 하다. 많은 사람(다중)의 이름이 숨겨진 이름(익명)이 되고, 덧씌워진 이름(가명)이 된다. ‘최윤’이 ‘윤윤최’를 불러와 ‘하나코’와 함께 제시한 찌꺼기와 이물질은 주변에 편재하여 당연하게 여겨지거나 감춰지고 잊힌 것들이다. 그렇다면 이 세상에 모든 하나코는 죽었나 살았나? 분열적으로 존재하는 수많은 하나코는 순간순간 끝없이 변이하면서 풍경의 경계를 헤집고 다닌다. Art Sonje Project Space presents Choi Yun’s second solo show Hanaco, Yunyunchoi, Choi Yun Solo Exhibition as its sixth project of this year. This show is supported by Seoul Museum of Art as part of Emerging Artists & Curators Supporting Program. The artist, under the name of Image Producer ‘Yunyunchoi,’ has updated fragments of the works (videos, texts, photographs, etc.) on her website. The fragments are all converted into images, stacked on top of a white background of the webpage, scorched and tangled up together. So it is not easy to determine the boundaries of the individual works as well as their respective material. Accordingly, individual elements with separate tenses come together at the website to make up a single scene. Such an approach prevails in Choi Yun’s works. In this exhibition, ‘Yunyunchoi’ is in charge of production and operation of images, throwing fragments at the gallery space as if uploading files to the webpage. Extracting components from the previous works, she has reproduced in another forms and exposes them attachable to one another at any given moment. ‘Hanaco’ is an anonymous character who is ‘not called by the real name’ and has appeared in Choi Yun’s works since 2015. In Hanaco and Mr. Kimchi etc. Playback (2016–), a single playlist which holds together various videos, a character, possibly Hanaco, keeps crossing over time and space as well as acting recklessly and beyond comprehension. For instance, Hanaco refuses to stand straight; instead she crawls, turns round and round while taking pictures, disorienting the point of the compass, exposes things that are better hidden, flings herself on the floor, and calls out to wall. The artist explains this behavior as “an act to somehow reverse the physical rigidity of maps.” The comment seems to indicate the will and confidence of the artist in carrying with the challenge even when the fixed ideas and firm norms likened to maps would not break from her reckless attempts. Hanaco and Mr. Kimchi etc. Playback comes out to the gallery space and appears as being divided and converted into countless Hanacos and tools. ‘Hanaco,’ a faceless body from the video, is realized in various images of the reality from the encounter with ‘Yunyunchoi’ in the gallery space. 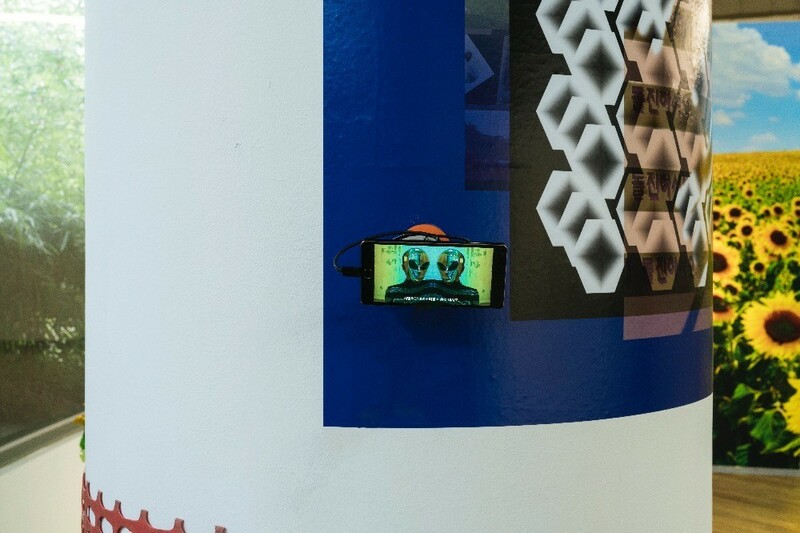 The objects from the video are laid out under the title of Performance Tool and Media Cache (2017); the existing Hanaco 50 (2015) is amplified into 100 characters each with 100 printed sheets displayed on the wall. They are pointing to one another within a state where it’s possible to access to the scene, like Hanaco from the video, by following the voices echoing in the gallery space. Choi Yun does not stop there but adds several elements in the gallery space. Shoddy objects that never made it to the scenes of Hanaco and Mr. Kimchi etc. Playback such as a Pikachu doll and food models are transformed and arranged here and there as the ‘media cache’ of the show. Around them cache of the cache that is left behind as residue of data despite countless attempts of elimination, like cache files sticks and functions as the insignificant decoration of SS series (2009–2017) that mimics online videos. Likewise, a greeting robot that awakes a vague déjà-vu—hi-bot (2017)—is standing by the entrance to promote the speed of communication. Window Picture Frame (2017) and Sunflower Wallpaper (2017), as images of complete products often used as interior accessories, are attached on the walls. These elements across over the walls as repeatedly attached and detached to one another. And they are linked to the scenes beyond the glass window of the gallery, toward the streets crowded with people wearing modernized hanbok, and another scenes. As ‘Hanaco,’ ‘Yunyunchoi,’ and ‘Choi Yun’ do not blend in together yet connect with one another somehow, the elements scattered on the exhibition floor jump between the landscapes again and again in an attempt to bridge them. In the end, the artist as a mediator interveins among several substitutes, ‘Hanaco,’ ‘Yunyunchoi,’ and ‘Choi Yun’, and yells out unrefined, multiple or anonymous voices. But why is she doing this? When it comes to ‘Hanaco,’ it is one of the most common Japanese names. But it could also be a nickname from an impressive ‘one (hana)’ ‘nose (co)’ from the face, or a name from the colonial era. The name of the many (multiple) becomes that of the hidden (anonymous), and an imposed name (fake). ‘Choi Yun’ calls upon ‘Yunyunchoi’ and with ‘Hanaco,’ presents media cache and debris that was taken for granted or forgotten. Then are all Hanacos of the world dead or alive? Countless Hanacos in fragments are endlessly transforming and tearing up the boundaries of the landscape.